Welcome to Vollrath University. I’m Chef Rich, and today we’re here to talk to you about the Vollrath direct contact heating system. The direct contact heating system is just that. It’s a system that its components work together to create a high-efficiency warmer. Here you can see the two components that make up the direct contact heating system. First we have the self-insulating thermal set well, and we also have the high-efficiency cast-in heating element. Again these two components together allow the Vollrath 700 watt warmer to meet the same performance criteria as much higher wattage units. These two items again, and because of the efficiency of when the water is in direct contact with the heating element, rather than heating through the bottom of the well, allows the most efficient heat transfer into the water. Now let’s compare one version of a traditional well and show some of the inefficiencies that these can have. As you can see in this version, the heating element is not located inside of the well. It’s actually located underneath the well. And as you can see in this manufacturer’s design, there’s actually about a 1/2" gap between the bottom of the well and the heating element. As you can see this is very inefficient. It’s much more efficient to have that heating element in actual contact with the water than it is to heat through this gap. A lot of heat is actually lost in this design, so much so, that this manufacturer has had to put these vents in the sides of the warmer to allow that excess heat to escape. So now we’ve shown you the direct contact heating system, but what does it mean? Because we’re more efficient at transferring energy into the water that means that we can use a 700 watt element where a lot of the competitor units need 1200 or more to perform the same task. Because of the inefficiencies of the element design, and how efficient our design is, again that 700 watt element can be used. Where that’s important is that we can put 700 watts in three of those units on your standard 120 volt, 20 amp circuit, whereas our competitive units one or possibly two units is maxing out that circuit. So it’s a much more efficient design. 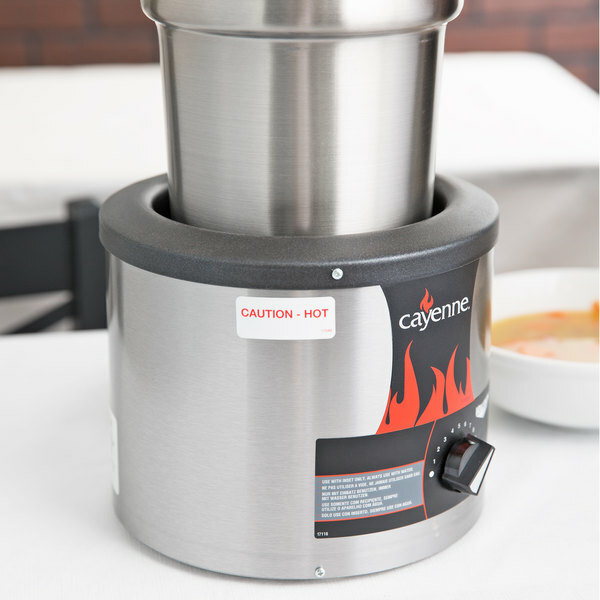 The direct contact heating system is available on 7 and 11 quart round warmers, full size countertop warmers, and is also featured in our line of serve well and affordable portable serving lines. Learn all the great benefits of Vollrath’s direct contact heating system. Their food warmers are great for a variety of applications, so check out this video for more details! Capacity per Compartment 4 qt. Do I need to add water to this warmer to use it? Yes, you do. We do not recommend running warmers like these without water, as you will run the risk of burning out your element or scorching your food. 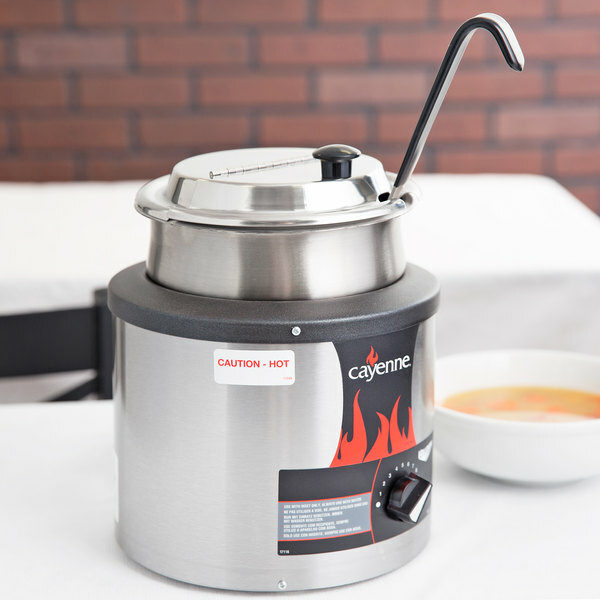 Keep your most popular soups, ice cream toppings, nacho cheese, sauces, and more hot and ready to serve with the Vollrath 72425 4 qt. round soup warmer! 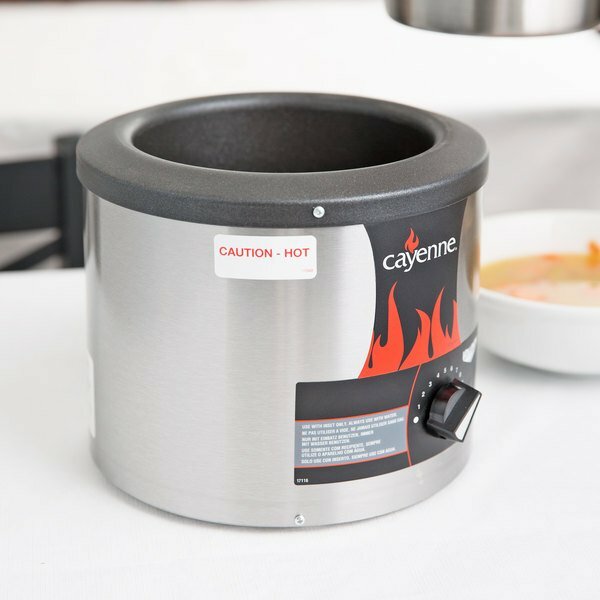 This soup warmer features 350W of heating power and a dial thermostat to give you easy and precise control of the heat to keep your signature soups at safe holding temperatures. 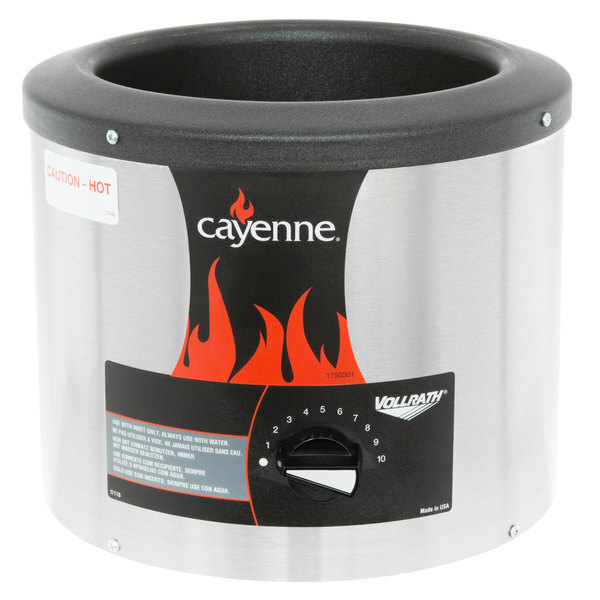 A versatile coated aluminum well holds 4.1 qt. insets or No. 10 cans, while the sleek, curved stainless steel exterior is easy to clean. 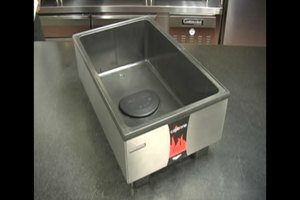 Additionally, this soup warmer comes with non-skid feet for added stability and safety. 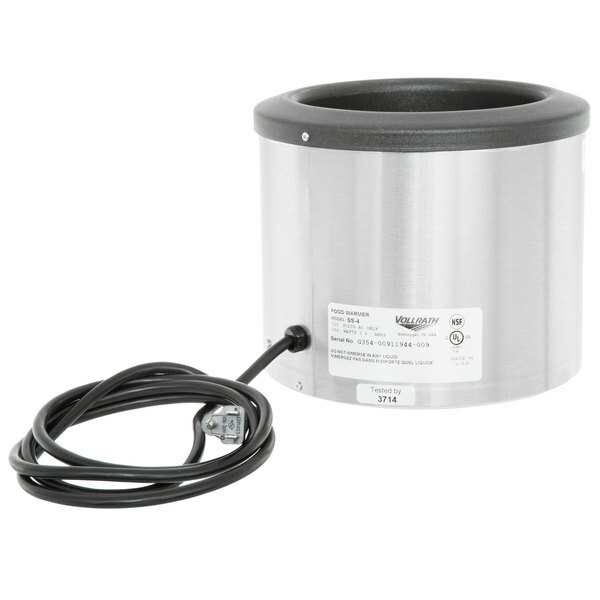 The Vollrath 72425 soup warmer requires a 120V electrical connection.